George Inness, who was born on May 1, 1825 in Newburgh, New York, was an American landscape painter, who influenced many other American artists and was in turn, influenced by several old masters, from the Barbizon School, the Hudson River School and the theology and spiritualism of Swedish scientist, Emanuel Swedenborg. Much of the mature works of Inness showed the influence of the scientist, with his works showing signs of spiritualism vividly. George Inness was considered as the father of American landscape painting, with his mature works not only showcasing the Tonalist movement but also the development of a unique and original American style of landscape painting. George Inness was the fifth of a brood of 13. At the age of 5, his father, who was a farmer, decided to move his family to Newark, New Jersey. At the age of 14 (1839) he studied under the tutelage of John Jesse Barker, a traveling painter. He later worked in New York City as a map engraver. Régis François Gignoux, French landscape painter, who was active in the United States from 1840-1870 took notice of George Inness, and he later became the young artist’s teacher. The Frenchman was a member of the Hudson River school and was the only one who specialized in snow scenes, which he painted meticulously. Gignoux was a National Academy of Design member and became the Brooklyn Art Academy’s first president. 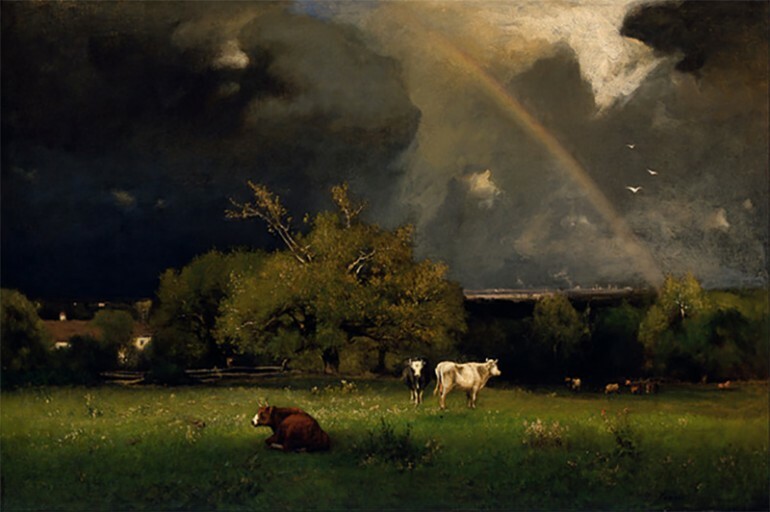 As a student at the National Academy of Arts, Inness closely studied the works of Thomas Cole and Asher Durand, both members of the Hudson River school and thought the he could combine the styles of the two prominent artists. In 1844, at the age of 19, George Inness showed his work at the National Academy of Art for the first time and four years later opened his own studio in New York. 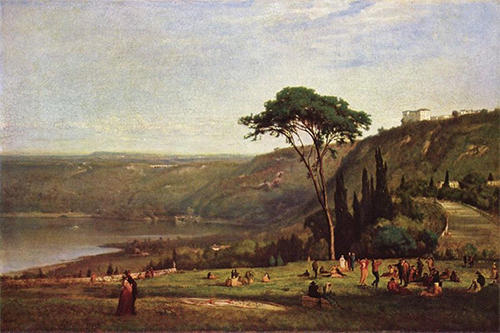 Ogden Haggerty, one of the patrons of George Inness sponsored the artist’s first European trip in 1851. He stayed for one year and three months in Rome and closely studied the works of Nicolas Poussin and Claude Lorrain. He maintained a studio that was above the one owned by another painter, William Page who was believed to have introduced Inness to the philosophy of Swedenborg. He became an Associate member of the National Academy of Design in 1853 and was elected in 1868 as a full Academician. Inness was influenced by the artists from the Barbizon School when he visited Paris in the early part of the1850s and quickly became a leading exponent of their style in America, and developed his personal style based on it. Inness received a commission from the Delaware, Lackawanna and Western Railroad in the mid-1850s to create several paintings to document the growth of the particular railroad system. During that time, America was undergoing an industrial revolution, but while Inness initially created paintings that integrated wilderness and technology into the landscape, his mature works favored landscapes that were inspired by places that he had seen. He stayed in Europe from 1870 to 1878 before returning to New York and had a studio in the New York University Building. In the 1860s and 1870s his landscapes were picturesque and panoramic, with skies that were often full of clouds with a threat of rain. Many were views of America while the rest were inspired by the sceneries he saw during his travels especially in France and Italy. He was considered one of America’s most successful and best landscape painters with his emotive employment of color, drawing precision and composition. His paintings were Impressionistic with a touch of the spiritual influence of Swedenborg. During the last phase of his life, Inness introduced soft-focus tonalism to his work, evidenced by some symbolism, naturalism, blurred outlines, feathery brushwork and application of light with a delicate touch. His paintings during the latter part of his life showed nature in its true form and his preference for autumn, the season which for him described the best poetry.